Two of the most respectable and valued brands in the U.S, BMW and Starbucks, have decided to work together in designing the Ultimate Expresso Machine. In case you haven't heard of them, BMW Designworks is a design studio that is part of the BMW Group and their goal is to focus on creating the coolest gadgets and unique designs for many large companies. In the past, BMW Designworks has teamed up with Boeing in redesigning the interior of a 787 Dreamliner. Now, they have done it again. They have created an expresso machine that can be bought at any Starbucks location. It's a small and slick machine that fits on your countertop and lets you keep it simple with espresso or go more complex with cappuccino. The BMW designers decided to leave off the Bavarian Motor Werks roundel. BMW Group DesignworksUSA designs iconic espresso machine for Starbucks Coffee Company. customers the opportunity to experience unsurpassed coffee enjoyment at home. In collaboration with BMW Group DesignworksUSA and Saeco, the leading coffee machine manufacturer, Starbucks has developed a unique espresso machine for domestic use. Those who wish to brew their coffee in the style of the espresso master, known in Italian bars and cafés as the Barista, can in the future fulfil this wish in a classy fashion using the newly developed semi automatic espresso machine Sirena™. This model combines the product characteristics of the original classic version, which is described as a portafilter, with state-of-the-art technical components. The espresso machine Sirena™ will be launched at select Starbucks Coffee company-operated stores in North America and on line in November 2007. The designers were faced with the challenge of creating an authentic product, the design of which reflected above all the distinctive identity of Starbucks and the quality associated with it. At the same time both product experience and design were to symbolize the expertise of Starbucks as well as its brand statement "Daily Inspiration" on a sustained basis. Starbucks epitomizes modern and discerning coffee-drinking more than most other brands as the company has refined and enhanced coffee culture with its coffeehouses. 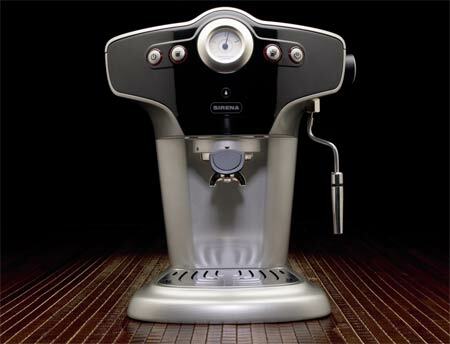 Its unmistakeable image and characteristic flair are reflected in the product design of the espresso machine Sirena™. In order to achieve these ambitious project objectives, the coffee specialist Starbucks collaborated with the global design studio BMW Group DesignworksUSA and the Italian company Saeco. The premium manufacturer Saeco is the leading producer of fully automatic coffee machines. The Sirena ™ excels through its distinctive, iconic design, superior quality and durability. Its styling and functionality fulfill the high standards set by Starbucks for its outstanding coffee products and is the embodiment of the unique, reflective, authentic and inspiring Starbucks lifestyle. During the two-year development phase BMW Group DesignworksUSA significantly utilized its skills in the fields of design strategy, product and color design as well as material design. In addition to the incorporation of technical requirements, functional user convenience and exemplary design, it was most essential that a clearly visible, unmistakeable design identity was created. In achieving this aim experts from BMW Group DesignworksUSA were intensively involved in the entire product development process. It was imperative that the new design language reflected both quality and functionality of the newly developed espresso machine as well as the fundamental values of the Starbucks brand. In this crucial stage it was necessary to translate the specific brand values into the appropriate product character with regard to product architecture, gesture, color, material, surface, operation and proportions. From a total of seven initial design concepts ranging from classic to progressive alternative interpretations of the basic orientation, four designs were chosen in a complex decision process and then revised and optimized. Finally, the end product design was the result of a combination of various elements derived from refined sketches. Two factors in particular were crucial for the final design, namely the American Art-Deco styling as well as Galleria, a concept that conveys the basic iconic gesture. In this respect the specialists at BMW Group DesignworksUSA were able to incorporate in particular their feel for the composition of cultural archetypes and visual patterns. Professional coffee brewing at the push of a button. Whether you are a beginner or an expert, the sophisticated but simple-to-understand functionality of the Sirena™ makes professional coffee brewing at home so very easy. In addition to optimum user convenience the machine offers clear and intelligible control of functions. For example, colored illuminating diodes signalize a specific status. The integration of two boilers into the system facilitates the brewing of espresso parallel to characteristic milk froth with a rapid steam process. The deposit area serves additionally as a hotplate for cups or beakers. The entire machine housing is made of metal. The black and silver colored material is produced in a complex die casting process. The Pannarello for milk foaming made of rustproof steel is a very typical feature. Authentic design as a factor of success for premium brands. With their involvement in the development of the Sirena™ semi automatic espresso machine designers at BMW Group DesignworksUSA have once again demonstrated their outstanding conceptual and creative know-how. This competence is based on thirty five years of international and cross industry experience with high-quality products and well-known brands. The cooperation with international manufacturers from the most diverse industries places the highest demands on design quality: on the understanding of identity and development possibilities of brands, as well as on the ability to incorporate customers' needs and design expectations. Thanks to these capabilities, BMW DesignworksUSA provides its clients with valuable incentives for translating the product concept into a tailor-made product character, a factor of success in achieving corporate objectives. The BMW Group subsidiary based in Munich, Los Angeles and Singapore partners with a number of renowned brand manufacturers. In addition to its activities in the field of automotive design. BMW DesignworksUSA serves clients in the field of IT and electronics, entertainment, lifestyle, packaging, in the home decor and luxury segment as well as in the fields of transportation design and sport.